On straight lines and in corners, its thick shoulders and continuous central rib ensure an immediate response to every situation and perfect vehicle control and handling. Its <<chamfered-edge>> sipes increase the rigidity of each tread block to enhance braking performance on dry surfaces. Maximum Safety on wet roads. Its directional tread design and unique grooving maximize water dispersal on straight lines. Around corners, its <<Vortex>> tread pattern effortlessly clears water, ensuring optimal braking times and excellent road handling. In deep water... a directional tread pattern with wide circumferential grooves maximises water dispersal to reduce the risk of aquaplaning. 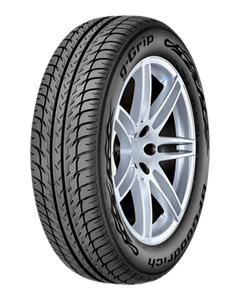 On normal wet roads, the g-Grip features a "vortex" tread pattern, designed to disperse water more quickly for better braking and handling. Unrivalled driving pleasure on dry roads. On straights and in bends... substantial shoulder tread blocks and a continuous central rib give a rapid steering response and superb control. With improved braking, its "chamfered edge" sipes improve the stability of each tread block for better braking on dry roads.